With Photoshop 6 or Photoshop Elements by clicking a butto, you can apply multiple settings to a single layer. 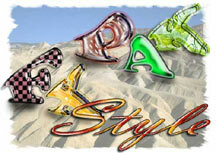 FXPak Styles is a library of more than 400 styles for text or buttons and more than 120 for layers (texture/pattern, etc.). Simply load the style you need in the palette et voila!